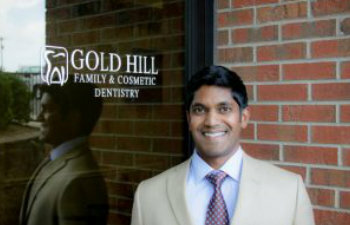 In honor of Father’s Day, Gold Hill Dentistry wants to remind all men out there how important it is for them to take care of their teeth – before dental issues occur. Studies conducted by the American Dental Association reveal that men are much less likely to visit the dentist until an issue arises. So, until they have pain in a tooth, bleeding or infected gums, or other oral health issues, they are not likely to visit the dentist. While this may seem how many people view all areas of their health (think about the last time you went to the doctor “just because”), oral health is actually highly affected by preventive measures. Regular dental cleanings and checkups are essential elements of a healthy mouth. Whether it is a busy schedule, complacency, or forgetfulness (accidental or on purpose), not taking the time to make regular dental visits a priority can wreck havoc in the mouth. Regular dental cleanings are professional means of removing damaging plaque on the teeth. Plaque is made up of thousands of damaging bacteria that eat away at teeth enamel and infect the gum line. When this plaque is not removed on a regular basis, it will continue to grow. “So, “you say,” I’ll visit the dentist every couple of years.” However, the bacteria grows at an astonishingly rapid rate, and waiting two years to have it removed can be extremely damaging and have serious repercussions. Research has linked oral health issues directly to cardiovascular disease as well as kidney issues and diabetes. So taking the time to regularly care for your mouth by visiting the dentist can have a positive impact on your entire life. At Gold Hill Dentistry, we focus on the promotion of your overall well-being and quality of life as it relates to your oral health. Our exceptional patient care begins the moment you enter our Fort Mill office, and we are committed to helping all of our patients achieve a healthy, confident smile for years to come. Don’t make the mistake of neglecting your oral health by putting off regular dental visits. They can save you from many oral health issues, and they can save your life.